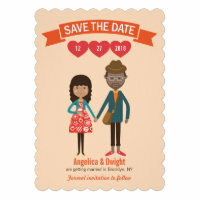 Imagine a unique wedding invitation suite that has a cute, lovingly-drawn indie-style cartoon illustration of you! To learn more, please see my notes at the bottom of this page. 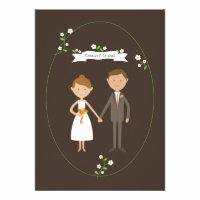 *This design is a Poptastic Bride original. 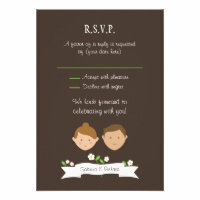 You can buy these cards as they are, or you can order them along with your own custom illustration. 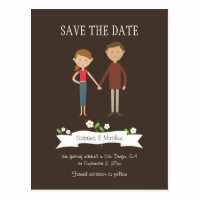 * An 8″ x 10″ digital file of a custom digital illustration of YOU on a white or solid background color of your choice that you can print yourself (or through Kinkos and other such printing companies) and frame. This will be sent via e-mail. 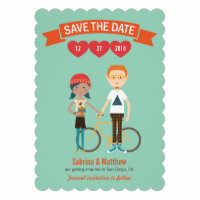 * Alternatively, I can take care of placing them on my ready-made invitation templates on Zazzle,com. Here are a few samples of what I’ve done. There’s more at the gallery (link below) and on Instagram. * You will need to show me photos / send me a photo of the two of you, facing forward, and describe the gown and suit you will be wearing. * Up to 2 revisions are included in the fee, after which $5 per additional revision will be charged. Payments will be accepted through Paypal. A 50% down payment is required. 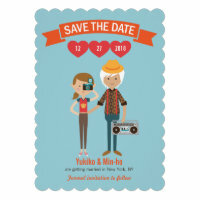 * Please add US$50 for an additional portrait of the two of you in casual attire for use in Save the Dates. (This discounted rate only applies if you are getting it along with the wedding portrait, If you are getting just the casual attired save the date portrait, the rate is US$150). * Additional people (kids, babies) will be $25 each. I can also include pets for an additional $15 each. * Please allow anywhere from 3-5 days for me to finish the illustration. 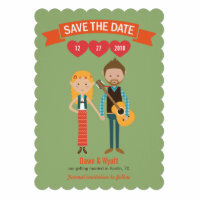 * Please add US$25 if you want to receive the portrait as a high-resolution .png or .psd file with a transparent background for use in your wedding or save the date paraphernalia.. Here are the discounted prices for the paper products when you order a custom illustration. 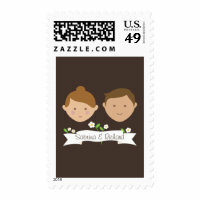 Prices are subject to change in accordance with Zazzle’s promotions.